Intex Technologies has come up with a very unique new "triple SIM" mobile phone. This, more than a decade old IT Hardware, Mobile Phones and Electronics Company, headquartered at New Delhi has launched IN5030 Triple SIM mobile phone (2GSM CDMA) with multimedia features at very reasonable price. 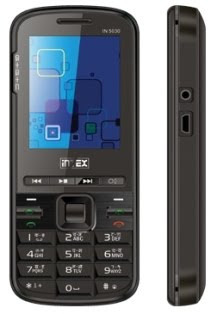 Intex IN5030 is a candybar phone with JAVA support and can hold three SIM cards together, 2 GSM and 1 CDMA. But user can make and receive calls on only one GSM connection and while making calls from GSM SIM card, the CDMA connection remains active. This allow users to shift between two GSM services easily. IN5030 has a 2" TFT screen displaying 65K colors, 1.3 MP camera which can also be used as a webcam, phonebook with 1000 entries, memory card slot – support TF/Micro SD card up to 4 GB, torch light, auto call record, supports English and Hindi languages and it works as a modem. Bluetooth and Mobile tracker are other fascinating features on it. Intex IN5030 has FM Radio with recording and scheduling feature, audio and video players with recording facilities for a full on entertainment. Battery back-up is great as it has a 1050mAh battery with talk time up to 4 hrs and up to 120 hrs standby. The tentative retail price tag of phone is Rs.4700.